In this episode of BioTalk, Chelsea spoke with chemistry and physics instructor, Dr. Stacy Trasancos. This goes far beyond Planned Parenthood. On a larger scale, it is actually a “controversy” of scientific/medical ethics. Tissue from elective abortions should not be being used in scientific research in the first place. Public outcry is key. So far the CMP videos have done a good job of rousing some outrage over the suppliers of fetal body parts. That’s why I’m glad some of the later videos shows the buyer’s perspective and just how widespread this problem is. Categories: BioTalk, Medical Ethics | Permalink. 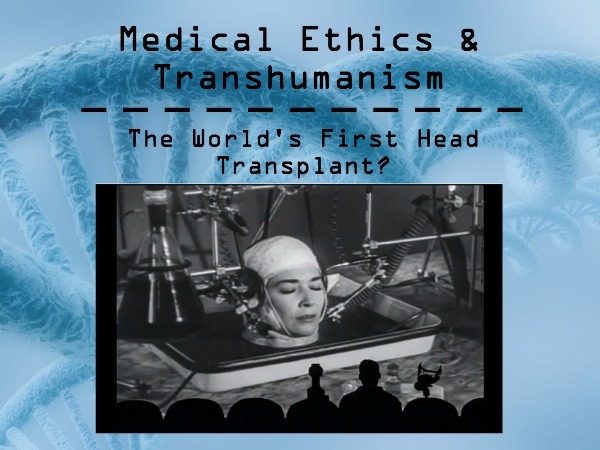 BioTalk12: The World’s First Head Transplant? No, this is not a joke or an onion parody. A man in Russia has actually volunteered to receive the world’s first human head transplant (or body transplant, depending on how you look at it). Valery Spiridonov, who suffers from a rare form of spinal muscular dystrophy, recently met with Italian Dr. Sergio Canavero who has agreed to perform the 36-hour operation. The procedure will also require Spiridonov to be put in a medically induced coma for 3-4 weeks. Spiridonov and Canavero were recently in the United States — where Canavero has said he wants to do the surgery — presenting their case to the American Academy of Neurological and Orthopaedic Surgeons (AANOS). Movie suggestion: The Brain that Wouldn’t Die (with MST3K commentary, natch). Categories: BioTalk, Catholic Bioethics, Medical Ethics | Permalink. BioTalk11: Three-Parent IVF — Make Your Voice Heard! In the latest episode of BioTalk, Rebecca Taylor and Chelsea Zimmerman give an update on “three-parent IVF” (aka “midochondrial donation or replacement”) and genetic engineering, what it means for our human future and what you can do about it. There is a very real possibility that the United States may follow the UK’s lead here. The FDA is once again revisiting their policy on three-parent IVF here in the States, and have asked the Institute of Medicine (IOM) to conduct a consensus committee to evaluate the technology. As part of their evaluation, the IOM Consensus Committee is holding open meetings for public comment on March 31, April 1 and May 19. If you are in the DC area, please consider attending and making your voice heard! If you are unable to attend, you can submit feedback to the committee here by clicking on “Provide FEEDBACK on this project” or you can email MitoEthics@nas.edu. That’s what we plan on doing; I hope you will join us (Rebecca has posted a sample letter that you can use). Let’s not sit idly by while the Brave New World advances. This technology is still new enough that we can influence public opinion — if we act now. If not, then it could take generations more to reverse what has been done. Please let them know how you feel about the genetic modification of future generations. Categories: BioTalk, Genetic Engineering, Human Cloning, Third Party Reproduction | Permalink. At the National Right to Life Convention last summer Chelsea caught up with Dr. David Prentice, former Senior Fellow for Life Sciences at Family Research Council now Vice President and Research Director with the Charlotte Lozier Institute, and chatted with him a bit about the current status of the great “stem cell debate”, how scientists are tinkering with human life these days and what, if any, positive signs he sees for trying to stop this train at some point. Categories: BioTalk, Human Cloning, Stem Cells | Permalink. CGS Newsletter: Frozen Eggs, Rented Wombs, Gene Tests and More! The latest newsletter for the Center for Genetics and Society is out. Lots of good stuff in here — especially about the recent decision by Facebook and Apple to offer their female employees a $20,000 benefit to freeze their eggs for later use with in vitro fertilization.